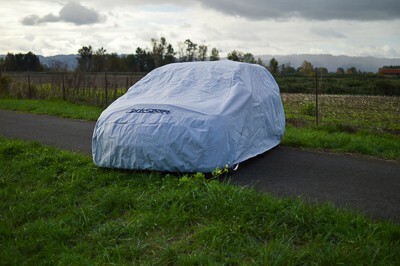 Don’t leave your Speed exposed to the elements; protect it with the CorkSport Mazdaspeed Car Cover. The CorkSport Car Cover features a five layer composite system that is both breathable and waterproof, but best of all, it has been custom tailored for the Generation 1 & 2 Mazdaspeed 3. This is the best fitting car cover available! #ZoomZoom! The CorkSport Car Cover is custom tailored to fit the 2007-2013 Mazdaspeed 3 while allowing enough wiggle room for extended spoilers and lips. Fitment also includes the 2004-2013 Mazda 3 hatch models. The outer two layers are made from strong durable polypropylene to shield the car from the harsh elements. 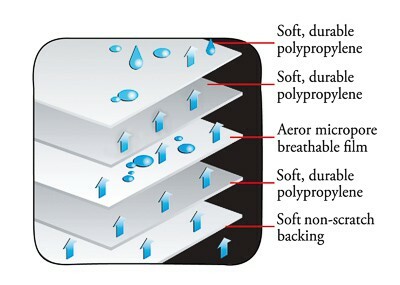 The third layer is an aeror micropore film that is breathable and 100% waterproof. The fourth layer is another layer of polypropylene to isolate the micropore film. This protects the film during handling and installation. The fifth and final layer is a soft non-scratching backing that keeps your Speed looking new. The outer layers feature a U.V. stabilizer for long lasting protection. All seams are ultrasonically welded for a water tight seal. The front and back feature elastic stitched hems that hold the cover tightly to the car. Compatible with: 2007-2013 Mazdaspeed 3 and 2004-2013 Mazda 3 hatch models. Accessories: Every car cover comes with a tie down and adjustable buckle for those windy days and draw string storage bag when not in use. Do not use on freshly painted cars. Do not cover the exhaust tip if hot and/or if the tip has sharp edges. It is recommended to not leave the cover on the car for more than 7 days at a time. Ensure the car is clean and dry before installation. It will take you less than five minutes to install the CorkSport Mazdaspeed Car Cover with our easy-to-use instructions. Perfect fit for my 2010 Mazdaspeed 3. Keeps the dust off the car when I have it parked during the week. You mentioned that the cover is not compatible with luggage/bike rack. Is it that critical? I just need some coverage to keep tree sap and leaves off the car. I'm not too concerned about a snug fit as long as the top and hood are protected. The price is right, but if it is a big problem, I need to know. It's not a big problem, but it may keep the cover from snuggly wrapping around the outside of the car. Why cant the cover be on for more than 7 days at a time? You mention not to use this cover on freshly painted cars. I bought this cover for my MS3 Gen 2 and it is being painted as I write this. How long should I wait before using the cover on the new paint? Also, I live in AZ where it is REALLY HOT. Does this cover have enough breathability so that it doesn't blister the paint off the car? I am pretty faithful about removing car covers daily, but I worry about leaving it on for 8 hours at a time. You'll want to give a few months to fully let the paint cure. Once its fully hardned you are good to go. It will repel a lot of heat and it some good breathability. I wouldn't to be to worried about leaving it on during the day as long as the paint is fully cured. Any idea if this can help protect from nasty hard water stains from sprinklers? It would protect from those things. Why can't the cover be left on for more than 7 days? I want to store my car for the winter and it will be stores in a barn that I really don't want to go at the end of 7 days to take off cover. And if it must be that way how long do I have to be able to put the cover back on after the 7th day? If you are leaving the car inside a barn, you dont need to remove after seven days. Will this cover work with a roof rack and bike rails? Is it safe to use for snow and ice? It is safe, but i wouldn't let too much snow/ice build up on it. Will this fit with a roof rack and bike rails?? Anyone done a test fit on a sedan? 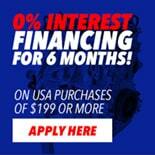 We have not heard of anyone test fitting this on a sedan yet.